Chloe Grace Moretz is so optimistic and eager for a chance at an adventure. You can’t help but adore the Isabelle character. 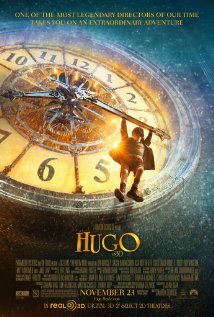 Asa Butterfield did a great job in the lead role as Hugo showing a lot of passion and emotion . The movie takes long to really get started. Mama Jeanne: Georges, you’ve tried to forget the past for so long, but it has caused you nothing but unhappiness. Maybe it’s time you tried to remember. Hugo Cabret: I’d imagine the whole world was one big machine. Machines never come with any extra parts, you know. They always come with the exact amount they need. So I figured if the entire world was one big machine, I couldn’t be an extra part. I had to be here for some reason. And that means you have to be here for some reason too. Hugo is an amazing mystery ,family adventure . It takes a while to get going , but once it starts you will bare witness to some superb story telling. The best movies are the ones that leave you with something to think about. This is no exception , it makes you think about your true purpose in life and not giving up on what you truly love. This movie has been nominated for an astounding 11 academy awards.